A balance sheet represents the entire picture of the company’s financial status from the given date. Being a company representative, if you are willing to check your company’s account balance or you are willing to analyze all transactions that play an important role to make up those balances. Refer QuickBooks, one of the gigantic accounting software that offers various built-in Balance Sheet Reports. 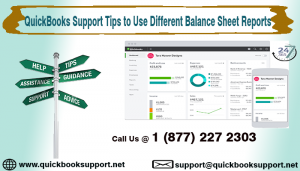 This article elaborates QuickBooks Support tips for generating distinct balance sheet reports in QuickBooks. Let’s delve into the details to understand the correct usage of QuickBooks’ balance sheets. A balance Sheet Standard report in QuickBooks includes each and every asset, liability, and equity account that your QuickBooks Chart of Account contains expect the accounts with zero balance. Under this report, QuickBooks will automatically set the “Dates Box” to “This Fiscal Year-to-date”, so the report represents your balance sheet for the current date. On the other hand, if you are willing to check the balance sheet for the end of the year or end of the quarter or end of the last year, then in such situations, you have to select This Fiscal Year, This Fiscal Quarter, and Last Fiscal Year respectively. QuickBooks’ Balance Sheet Detail Report represents all transactions from your asset, liability, and equity accounts over a specific time period. In case, you are observing some odd numbers on your Balance Sheet Standard Report then use the Balance Sheet Detail Report in order to verify your transactions. In case you are willing to analyze the key numbers from your balance sheet without initialing to scan past the individual accounts from each section, then use QuickBooks’ Balance Sheet Summary Report to analyze subtotals from each respective category of balance sheet, for instance, Accounts Payable, Checking/Saving, Account Receivable, and so on. This report is specifically made available for QuickBooks Enterprise or Premier Users only. Balance Sheet by Class Report includes the record of your asset, liability, and equity accounts, along with a column for each respective class. However, if you are willing to obtain appropriate results from this report, you have to update all required transactions in a prescribed way, for instance, recording transactions using QuickBooks attributes such as Receive Payments or Create Invoices. If you want to compare your company’s current financial strength with the previous years, then QuickBooks’ Balance Sheet Previous Year Comparison Report presents four columns at your services including one column for the current year, one for the previous year, third for the dollar-value exchange, and fourth for the percentage change. Above tips bestowed by QuickBooks Support professionals for the correct usage of different balance sheet reports in QuickBooks. In case you are still facing troubles while using QuickBooks’ Balance Sheets then feel free to call our QuickBooks help number, 1-877-227-2303 for availing instant help from our certified experts.